One of the tasks before us this week is the packing up of Dallas’ office. You may wonder why I say this involves “us.” It is because while we have separate offices, they are right next door to each other and we share our resources between both of them, specifically our books. One of the things we will have to do this week is figure out which books stay with me and which go with Dallas, which is a bigger deal than it might sound. It was almost thirteen years ago now that I met Dallas on our first day attending McMaster Divinity College. Three weeks later, we began dating. It’s a small school, so we had almost all of the same classes in that first year. When we got to our second semester, we had already been dating a few months when the time came to buy books for our classes. I believe we had three classes together that term, and as many of you will know, University text books are EXPENSIVE. So we were faced with an interesting litmus test in our relationship. Should we share our text books? We often studied together anyway, but were we ready for such a big move? What if we broke up? In the end we did decide to only buy one set of books for the classes we had together, but we (somewhat jokingly, but somewhat seriously) came up with a “book prenuptial agreement.” We agreed on who would keep what books in the event of break-up. I don’t know who got what book anymore, as the agreement proved unnecessary when we got engaged a couple of months later and married a few months after that. Two years later, we finished school and ended up working at the same church. Once again all of our commentaries, theology books and ministry resources were in the same spot, passed back and forth across the alcove that connects our offices as they were needed. And now Dallas is going to start a new job in a new city and after nearly thirteen years together our library is going to be divided. This is a lot for me to take in. Besides the sheer inconvenience of it, it’s an emotional symbol for me of the massive change about to happen in my life. As I’ve said before, I am so thrilled for Dallas for his new opportunity and believe from the bottom of my heart that it is where God wants him. I guess there is still some part of me that just wishes that Dallas could do this new thing and everything could also stay the same at the same time. Is that really too much to ask for? My guess is that a lot of you have felt the same way when a new thing is upon you. You’re open and ready and maybe even excited about what’s coming…but then you realize that your books are all going to be split up and the reality of change all feels a bit overwhelming. Back in January our women did an exercise together as we faced a new year. I invited them to each choose a “word of the year” – a word that they felt was meaningful and that could help shape and guide them for the year to come. Do you know what word I picked? It was the only word that felt right. I had been doing ministry at Mount Hamilton for nearly ten years and I sensed that God was saying to me that I had to be open to new things – new ways of doing things, new ministries, new ideas. 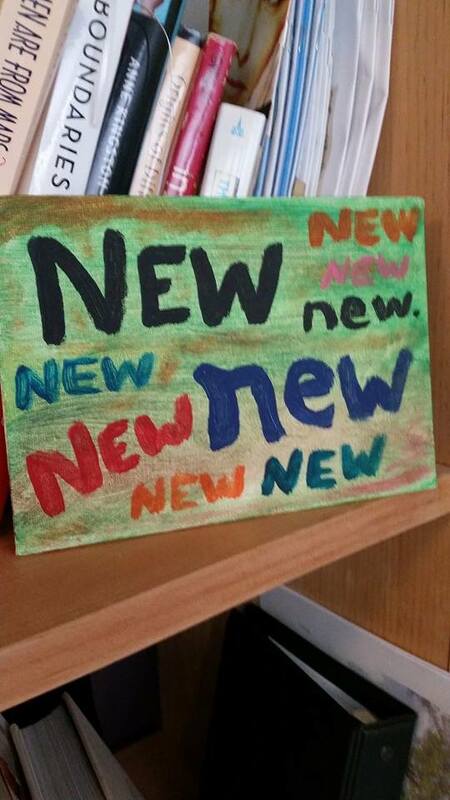 I even made a little piece of art to remind me of my word and put it in my office – right on my bookshelf. I had no idea at the time all the “new” things the year would bring, and today I look at that little painting and remember that what I felt God telling me in January is still true. Be open to new things. They are not better or worse; they are just different. So now all our books won’t all be in one space. We will need a new way to keep track of our resources. I’m guessing we’ll probably keep a list of which books are in what office, and I’ll have to be a little more organized to let Dallas know when I need a book ahead of time. The truth is that I’m not “losing” half my library. My library is just being organized in a new way. No enforcement of the “book pre-nup” is necessary! Just grace. And patience. And hope. I grinned at several points during this post; had Karen and I overlapped in more courses, I’m sure we would’ve considered something similar. Also, feel free to return books borrowed from our place before Dallas accidentally steals them. YES AND NEW = Thanks Christ for the ride at MHBC. We seek Your vision as we continue in the NEW era but not forgetting YES AND. What a great God we serve.